Leave a Comment / Business Resources, Game Dev Resources / By Davis Ray Sickmon, Jr. Originally, this was going to be a quick post for indie game developers, but as I started putting a few of these resources on the same page, I realized all of them are useable for plenty of applications outside of game development. If you’re doing anything for online marketing, a lot of the resources on the linked pages are for you. If you’re doing real-world marketing, well, some of them still apply to you – for instance, the information on press releases. HubSpot’s Marketing Grader at first didn’t appear to be something I’d find interesting. I’ve ran across a couple of SEO optimization products, and most of them really aren’t that useful. Heck, most of them are a thinly veiled attempt to sell you a report, get your name on their mailing list, or sell you a product. 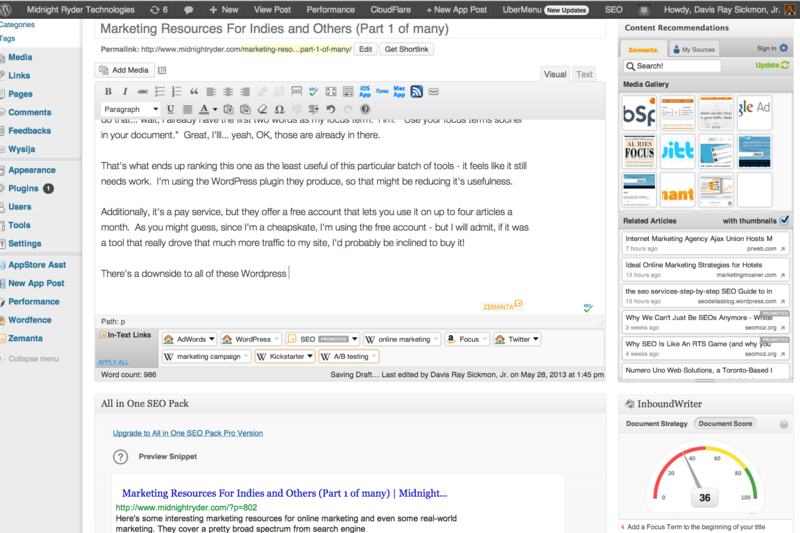 Don’t get me wrong: HubSpot is trying to get your on their mailing list and sell you a product. Imagine my surprise when I tossed a couple of the domains I own and ones I deal with for other customers, and it returned me actual useful information. Without having to buy a report, and without having to sign up for anything! The Marketing Grader is pretty slick, really. It not only does SEO analysis – a dime-a-dozen service – but it digs deeper, looking into things like how often your posts are being re-tweeted on Twitter and shared on Facebook. Not bad. It provides and aggregate score (higher is better) for your site(s), and give you a really good checklist of things to do about it. Most of them are things I tell my customers to do – for instance, blog every week or two. It says every 10 days on average. By using it over time, you can get a really good idea what’s working and not working about your blogs – how many people found what you said interesting enough to tell others about it? And, it breaks down the analysis down into chunks that make sense – OK, people are hitting the landing pages, now have you done things to convert them into potential customers or long time readers? Overall, well worth using. InboundWriter is possibly the least useful link in the batch – which means, it’s still pretty useful, it just ends up at the bottom of the list. I already use in-article SEO stuff (All In One SEO for WordPress on MidnightRyder.com, for instance) to help improve keywords and search terms. I also use the Zemanta WordPress plugin to gain applicable outbound links and images. This one goes a bit further – as you write, it analyzes what you’re working on, and gives you a potential strategy for your keywords. For those who don’t know, there’s more to being found on Google than just writing an article. There’s a lot of matching your keywords to your content, then matching that to your target audience. InboundWriter helps that a bit – you tell it about what you’re writing (for instance, this one is on marketing resources), and it goes out and tries to find applicable keywords. Also, give it a “document strategy”, and it will try and find keywords that help with search engine optimization by matching that strategy: do you want to go after the already heavily used keywords, or do you want to find keywords that are being used by other sites less often? Is optimizing for advertising platforms (like Google AdWords) important? What level of education is important for your article? Then, it breaks it down for you – how often are you using the focus terms? What other focus terms should you use? And, what should you be doing to improve the over all search engine friendliness of your article? Based on all that, it gives you suggestions and a document score that updates semi-realtime. Now, one nagging thing about it: attempting to follow the suggestions never updated the suggestions. For instance, while I write this, it tells me to “Add a Focus Term to the beginning of your title.” Great, I’ll do that… wait, I already have the first two words as my focus term. Hm. “Use your focus terms sooner in your document.” Great, I’lll… yeah, OK, those are already in there. That’s what ends up ranking this one as the least useful of this particular batch of tools – it feels like it still needs work. I’m using the WordPress plugin they produce, so that might be reducing it’s usefulness. More of my screen is now taken up by SEO / writing tools than the actual articles! Additionally, it’s a pay service, but they offer a free account that lets you use it on up to four articles a month. As you might guess, since I’m a cheapskate, I’m using the free account – but I will admit, if it was a tool that really drove that much more traffic to my site, I’d probably be inclined to buy it! There’s a downside to all of these WordPress marketing / SEO tools I’ve added to my site(s): it’s amazing how much clutter it ends up adding to the site when I’m writing!